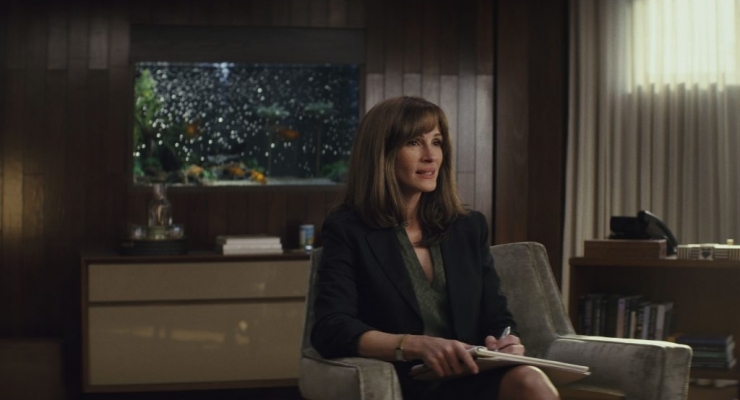 Julia Roberts may have been making motion pictures for more than three decades, but Homecoming provides her first leading role on the small screen. This ten episode series was originally a podcast written by Eli Horowitz and Micah Bloomberg, and, seeing its potential for television, Amazon Prime Networks picked up the show for its first season. The storyline fluctuates between the present and four years in the past as shown by half-screens for the former and full screens for the latter. Heidi Bergman (Roberts) had been a caseworker at the Geist Homecoming Transitional Support Center, a facility designed to help soldiers suffering from PTSD to reenter civilian life. She receives constant phone calls from her supervisor Colin Belfast (Bobby Cannavale) that not only intrude into her daily life but also destroy her so-so relationship with boy friend Anthony (Dermot Mulroney). One of her “clients,” Walter Cruz (Stephan James), is leaving the military after three tours of duty in the Middle East and their therapist-patient relationship drives much of the ensuing drama. Flash forward to the present and Heidi is living with her mother Ellen (Sissy Spacek) and waiting tables at a Florida diner. Department of Defense Agent Thomas Carrasco (Shea Whigham) shows up and questions her about a complaint filed against the Homecoming center but, surprisingly, she remembers nothing about her time spent there. Carrasco’s supervisor Pam (Brooke Bloom) tells him to close the case for lack of evidence, but the suspicious agent doggedly pursues his investigation. The soldiers at Homecoming receive medication as part of their PTSD treatment, but something seems not quite right about their six-week rehabilitation program. Walter begins to experience major memory gaps and when his mother Gloria Morisseau (Marianne Jean-Baptiste) finds that he is not in a VA-approved program, she visits the Geist facility only to find that her son has been persuaded to stay there. When Heidi invites Walter to join her for lunch (his second of the day) in the client cafeteria, an action forbidden by Homecoming rules, there are consequences that will change both of their lives. Past and present eventually collide when Colin finds Heidi at a laundromat and she fails to recognize him. After dinner, drinks and some sack time at a motel, they visit the Homecoming building and find that it is now an upscale Wellness center. Suddenly Heidi’s memories are rekindled, and when Thomas Carrasco confronts her former boss, Heidi decides to blow the whistle on the project. The dutiful DOD agent now has what he considers sufficient information to file a report that is intended to reach the Inspector General’s office, but will it get there? Homecoming’s strong cast is led by Ms. Roberts who appears more haggard than I have ever seen her—an effective visual transformation for a woman troubled by the recollections of what she has done. Bobby Cannavale is the archetypal wheeler-dealer while Stephan James absolutely nails his role as the young soldier who has entrusted his future to the shady rehabilitation center. Director Sam Esmail burst onto the scene with his acclaimed USA series Mr. 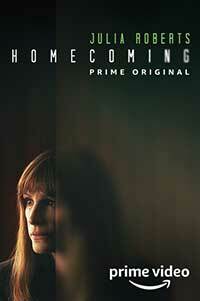 Robot and brings an unerring sense of pacing to this psychological thriller. A nervous tension prevails over each thirty-minute episode and the unpredictability of Bloomberg and Horowitz’s script makes the show quite binge-worthy. Some dangling plot elements await the already announced Season 2: the unidentified leaf Carrasco receives from one of the former Homecoming clients, the nature of the red solution kept in laboratory tubes or the future of Geist enterprises when Carrasco’s report arrives at the IG office. Given the seemingly endless involvement of American forces in the Middle East, a number of the themes presented in this series remain quite timely. Highly recommended. A tense psychological thriller that marks Julia Roberts' small screen debut as a troubled case worker in a mysterious rehabilitation facility that aims to help Middle East war veterans return to civilian life but may have a very different purpose.